Noorden Food Bar brings “modern Dutch” to Toronto: street food style dishes from the Netherlands combined with Indonesian influences for an extra boost of flavour. 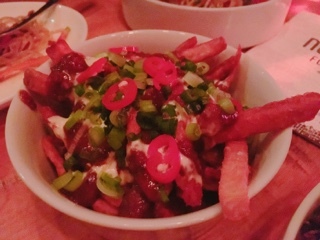 The restaurant’s hip and has a Queen West vibe, except it’s in Midtown and the music is kept at a reasonable volume. Described as their “most popular dish”, the patatje oorlog or war fries ($7) were a disappointment. While I appreciate crispy fries, Noorden double (perhaps even triple) kiss with the hot oil was too much, rendering the fries hard, dry and hollow. In lieu of ketchup or gravy there’s sweet soy mayonnaise and peanut sauce, creating an interesting sweet and salty combination with scallion and bird’s eye peppers for freshness. 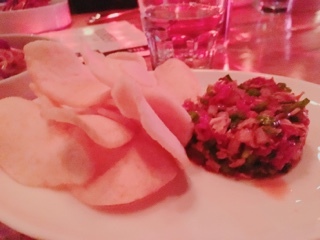 If you’re squeamish about raw beef, Noorden’s beef tartare ($14.75) is a safe introduction. There’s plenty of sweet soy glaze that drowns out any beef flavour; the sweet pickled Asian pear and aromatic crispy shallots will cover anything else. 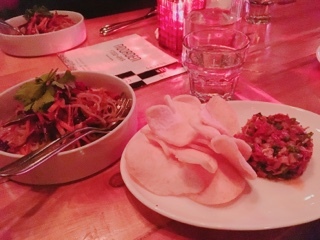 Don’t misunderstand me, it’s a good dish – it wakes up the taste buds and the krupuk (thick crunchy shrimp chips) really holds up against the saucy tartare. 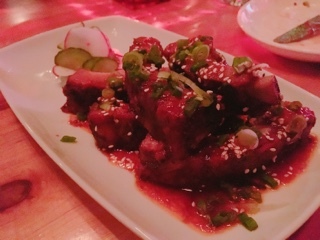 Five pieces of stick-to-your-ribs ribs arrives with the pork ribs ($15), each slathered in a sweet and tangy sambal cobek sauce. The fermented shrimp used in the condiment adds an umami essence to the meat; they sure are tasty, but also fairly salty so you wouldn’t want a full rack. Don’t forget about the small pile of slices cucumber and radishes on the side, it’s a salad and works so well at cutting against the grease and heaviness. The sambal matah ($7.50) could be the next answer to roasted cauliflower and Brussel sprouts. 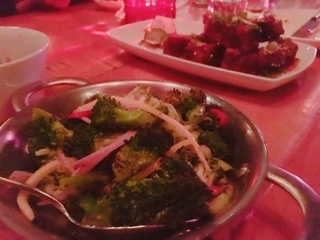 The charred broccoli concentrates the vegetable’s flavour while adding a smoky nuttiness to the florets. Bringing the tried and true broccoli to the next level of tastiness, the crunchy shallots are a great pairing, but the lemon rind needs to be picked out as the bitter chewiness can be a bit of a shock. 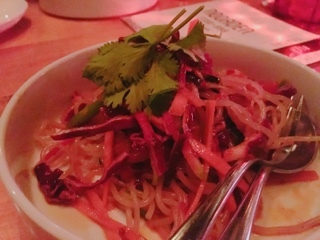 Noorden also offers dishes like the sweet potato glass noodles and vegetable salad ($10.95) that don’t appear to have a touch of Dutch influence at all; the chewy noodles are popular in South East Asian countries and even the dressing (a white miso sambal vinaigrette) weighing heavily to the Asian contingent. Nevertheless, it was one of the better dishes. Refreshing and satisfying, the crunchy salad is tangy, spicy, savoury and sweet all at once. After hearing the name of the Dutch beignets, oliebollen ($6), the dish already sounds cheerful. Indeed, one bite into the warm yeasty dough studded with currants and ginger and a smile spreads across my face. Their milk chocolate buttermilk pudding ($6) is the consistency of crème caramel and ever so slightly sweetened. Keeping the pudding neutral, the dessert’s flavours predominantly stem from the dark chocolate ganache layer on the bottom and the airy whipped cream. 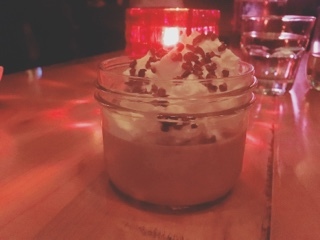 I particularly liked the crunchy cocoa nibs pieces sprinkled on top, which goes so well with the smooth pudding. Chef Michael van den Winkel and Jennifer Gittins also operates Indonesian restaurant Little Sister, just a few doors south on Yonge. With the sambal, chillies and peanut sauce touches, there are similarities between Noorden and Little Sister. Up until dining at Noorden, I didn’t even realize Dutch cuisine gels so well with Indonesian ingredients. As a warning, portions are rather small; heed the restaurant’s advice of sharing five to six dishes amongst two people. Nonetheless, the strong robust flavours lends itself to being served as small plates … I can only imagine the gluttonous feeling if I ever consumed a full-size portion. What is most memorable about Noorden is the laid back Dutch hospitality - the smiles, attentive service and even the bartender steps up to offer an extra seat when we bumped into others. As blogTO reported, the restaurant’s lease ends mid-2018. 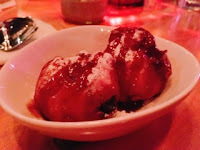 So, if you want a taste of Dutch friendliness, you better oliebollen over there soon.